New: Prepare individual portions and small quantities of salad dressings, sauces or mayonnaise easily and quickly. Recipe booklet included. Effortless pureeing and mixing, without annoying splashes: the newly designed stainless steel mixer foot. Including measuring jug. Chops herbs, parmesan, nuts and other hard ingredients easy and quick: the handy mini chopper attachment. Perfect for pestos, sugos and more! 600 watts — power and convenience. Powerful with low noise and low vibrations. The 600-watt motor makes short work of anything you want to mix and crush — and it's incredibly convenient. Stainless steel foot — stylish and effective. Your CleverMixx Dip & Dressing: the SlimFoot is ideal for preparing tasty dips, salad dressings or sauces - quickly, easily and also in small quantities. A recipe booklet in 5 languages is included. 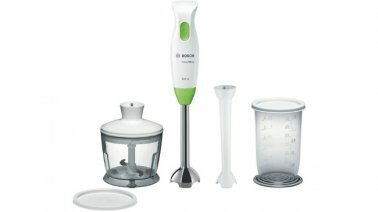 Easiest cleaning: All accessories are dishwasher safe: the rostfree and longlife stainless steel blender wand, the measuring/mixing beaker and the additional SlimFoot for small quantities. NEW: The additional SlimFoot: Perfect for small households, for preparing individual portions of desserts, dressings, sauces etc. in between time. Ideal for preparing of baby food. Suitable for the operation also in small jugs. Handy mini chopper cuts herbs, nuts, onions, meat, cheese, ... with practical lid for a fresh and clean cooling of your food in the refrigerator. Transparent calibrated mixing-/ measuring beaker with lid for a fresh and clean cooling in your refrigerator.